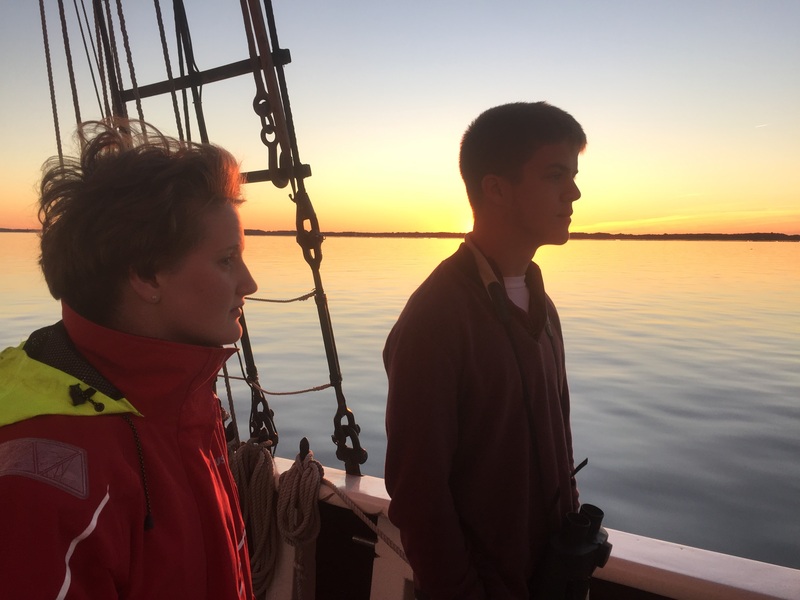 This weekend, Proctor's Ocean Classroom crew of twenty-one students continues departs Georgia for a fourteen day passage to St. Croix. 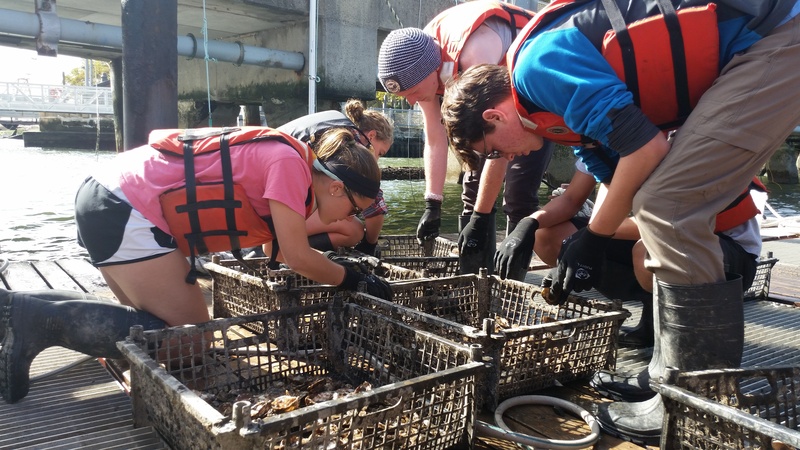 Five weeks into their once in a lifetime journey, students reflect on midnight bow watches, bioluminescence, dolphins, and living and learning alongside their best friends. I am currently on my first midnight to 04:00 watch. It's 02:30 now and Emily let me sit on deck to do some homework. The sky is so dark yet the stars are so bright. Sometimes I forget the sky on the ocean is the same as on land. I know that sounds stupid, but it is so magnificent on the boat. It's kind of like when you turn your brightness up on an iphone. The actual info on the phone remains, but everything becomes more vivid. Tonight I saw bioluminescence for the first time. Wow! They are absolutely incredible. I got this weird feeling in my stomach. It felt as though I was watching magic. Little neon lights shoot off the boat and disappear again. Everything is nearly pitch black except the stars in the sky and the glowing waves off of Roseway. Many people are learning about the bioluminescence for their science projects. Not me. As breathtaking as the neon plankton are I am oddly satisfied knowing nothing about them. I want them to remain magical and mysterious. This is the first time that something has caught me by surprise and extended my view of what exists. This glowing water has become my new Santa Claus. The best part is every time I get up for night watch, it's like Christmas morning. My journal entry yesterday was super short because I had to go muster for watch but I didn't really have anything else to say anyway because not much happened. Today, though, was so crazy. So first of all I had watch from 8AM-12PM and the waves were huge today, the biggest yet for sure. The wind was so strong and the boat moved around a ton; helm was super difficult today. We saw dolphins jump out of the water right next to the boat and that was so cool. The whole day was just so crazy, the water was so blue and the waves looked photoshopped because they came so high against the boat. Bow watch was really fun ~ Avery and I sang songs. Oh and the main sail had a hole in it and so we had to take it down. 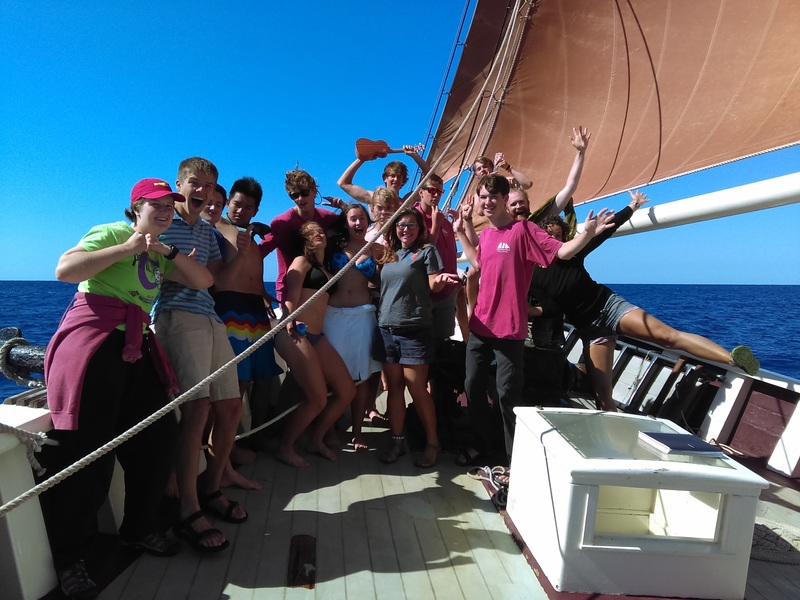 That was so fun, I just kept thinking throughout the day "this is what ocean classroom is all about, these are the moments that define the program, this is why I wanted to do ocean so badly". I kept replaying these thoughts in my head and it just made me so happy ~ today was awesome. Tomorrow morning we will be arriving in Cumberland Island, Georgia! I stood at the bow, with my right hand at the jumbo sheet pin. We were traveling upwards of 10 knots, and in 4+ foot seas. Looking over the port side down at the waves we were crashing over revealed that the water was full of bioluminescence. Each crashing wave glowed with the small plankton that create stars in the sea, it was incredible. Cruising at 10+ knots, big waves, clear night sky, bioluminescence, can it get any better. Yes. "Hand to foreward" Cavo commands our watch. It's 02:00 and we're striking the jib! I'm on the down haul, Noah is on the jib halyard, Taylor on the sheet, and Emily on the other downhaul. "Strike the jib!" Cavo called. The jib fell as the halyard and sheet were eased, and I scrambled, hauling in the downhaul as fast as possible. Today marks day 31 of our Ocean Classroom experience. The past few days have been emotional rollercoasters for many of us. The midterm workload quickly built up, late-night study sessions began and study guides covered the tables of the main salon. If we’ve learned anything aboard the Roseway (besides how to tie a bowline), it’s that plans can change at the drop of a hat. Although everyone was looking forward to arriving in Charleston, SC, unfavorable wind and tide patterns took it off the agenda. 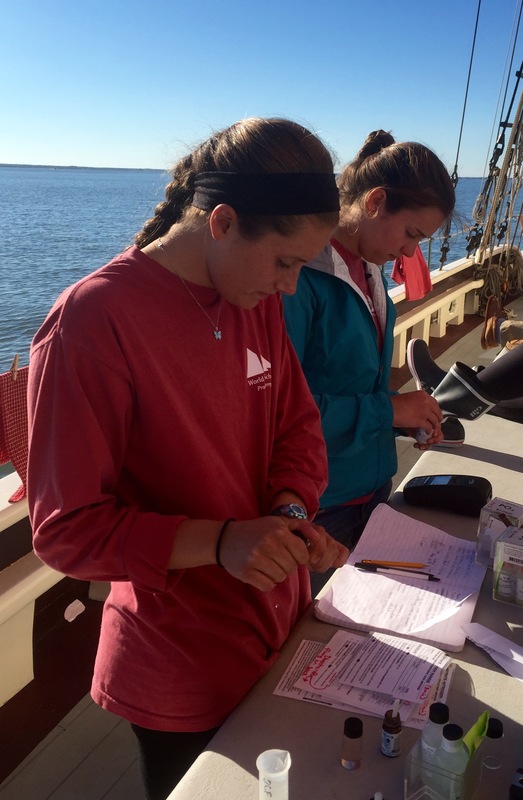 We spent another night anchored outside of Cumberland Island, and the Charleston Port Report group still presented their research findings (in the form of a rap song and game of Jeopardy). We then continued down the east coast to St Mary’s, GA.
We were fortunate enough to dock side by side with the Peacemaker, a Barquentine ship built in 1989 and owned by the Twelve Tribes. The owners of this beautiful vessel turned our 24 hour stay at St. Mary’s into a luxurious and fun-filled day. As soon as we docked, we were peppered with a constant stream of snacks and refreshments. We took the opportunity of a few restful hours to clear out, spray and wipe down our racks. This long-awaited project was much needed. The odor of Lysol hung in the air for many hours. The Peacemaker graciously provided 21 disgusting high-school students with warm-water showers, and we sent our crusty clothes to be washed. Our cleaning was interrupted by the arrival of Captain Tom laden with our mail for Charleston. He drove (stuck in traffic for hours) all the way from Charleston to bring our long-awaited mail. We ripped apart a record-breaking number of packages, devoured an ungodly amount of sweets, and teared up while reading the heartwarming messages sent from family and friends. A slew of activities followed our mail session. We were granted free-time in the small town of St. Mary’s. Some of us came back with books, ice cream and other various goodies (as if the packages weren’t enough). We broke down boxes, consolidated and moved trash off the deck, and packed Roseway full of food to begin the two-week transit to St. Croix. We are all nervous. We are all excited. We will all be very tired. But all of us are prepared, whether we know it or not. The journey ahead will test us physically, emotionally and mentally. We are treasuring each and every day that we have with each other - there are only 28 of them left. 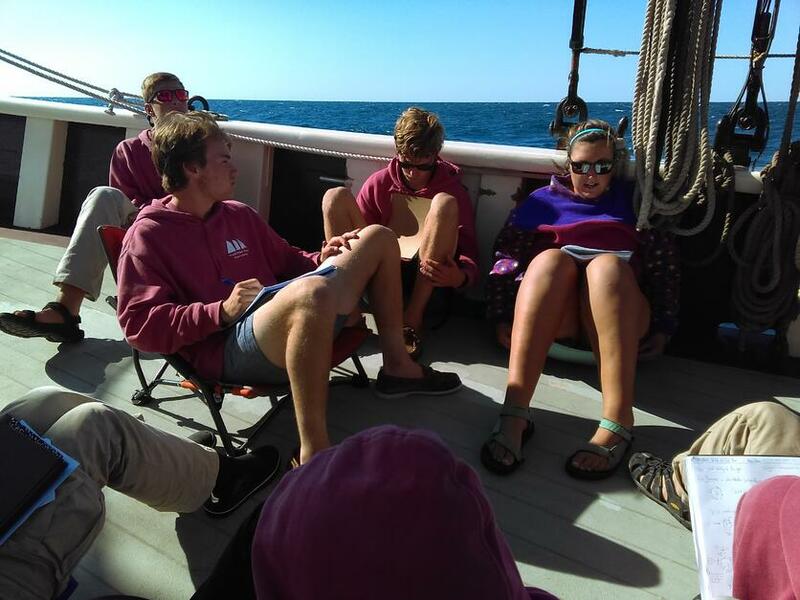 The crew had a chance to meet up with Ocean Classroom Director Dave Pilla last week in Cumberland Island, and now are ready for the remainder of their journey to the Carribbean and their longest voyage yet.